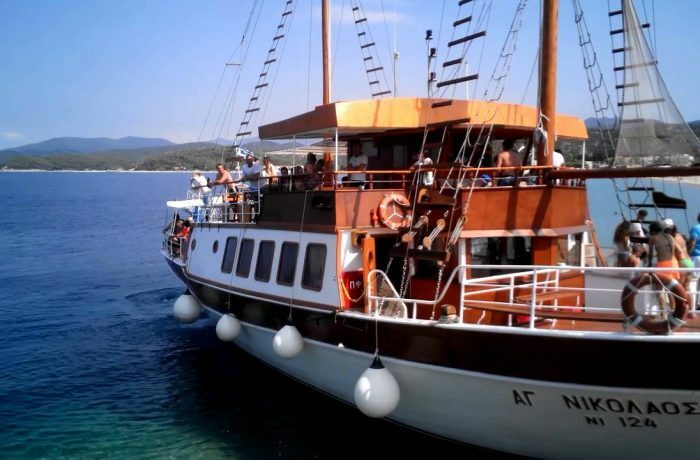 Departing from Pefkohori, the first stop at boat cruise around Toroneos Gulf will be at an isolated beach in Toroni for approximately two hours of swimming and sunbathe. After enjoying the crystal clear water and the turquoise sea, you will get back on the boat and get ready for your lunch and drink, enjoying the way to our second stop. Next stop will be Neos Marmaras where you have free time to explore the village for shopping, stroll around the village or relax in a café. Then, you continue your cruise to the unique turtle-shaped isle of Kelyfos. There you can swim just next to the islet or simply enjoy diving directly from the boat. After a 30 minutes stay in Kelyfos you will set off to head back to Pefkochori. NOTE: Don’t forget to keep your eyes open for the dolphins!